ABSTRACT: The Great Barrier Reef has been well documented in recent media because of concerns about its declining quality. The presence of marine turtles, dugong and dolphins was a key component in having the GBR listed as a world heritage site. Now there are concerns for these species – for green turtles there has been catastrophic failure of reproduction for around 15 years. Since 2005 our JCU group have been working on a multi-disciplinary research project to understand the futures of green turtles in the GBR. Our research has focused on three main themes (1) improving knowledge on species biology and habitat use, (2) quantifying risks from climate change and coastal development and (3) understanding the social, economical and governance aspects of turtles and their management. In my talk I will explore some of the options and discuss the perceptions and reality for green turtles in the GBR. There is a future for green turtles in the GBR but it will take prolonged support from Government and patience. BIO: I have a long standing interest in Australia’s marine environment. I did honours at Flinders University in Adelaide and then a PhD at University of Queensland. My PhD research focused on understanding the environmental and physiological drivers of reproduction in green turtles. 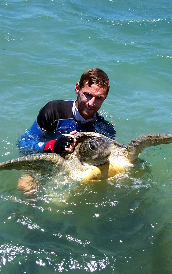 Since my PhD I have worked on turtle projects across most of northern Australia and SE Asia. My current research interests are broad and I am involved in project spanning several disciplines – the general theme however is research to improve the knowledge base for decision makers. Some examples of current projects include, understanding plastic pollution loads in the GBR, tracking turtles and dugong around ports to quantify risks, understanding the links between Indigenous and Western knowledge and how they can be combined to improve management. For enquiries and appointments with the guest speaker, please email Graeme Hays.